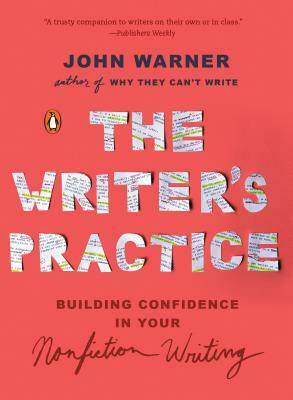 After a decade of teaching writing using the same methods he’d experienced as a student many years before, writer, editor, and educator John Warner realized he could do better. Drawing on his classroom experience and the most persuasive research in contemporary composition studies, he devised an innovative new framework: a step-by-step method that moves the student through a series of writing problems, an organic, bottom-up writing process that exposes and acculturates them to the ways writers work in the world. The time is right for this new and groundbreaking approach. The most popular books on composition take a formalistic view, utilizing “templates” in order to mimic the sorts of rhetorical moves academics make. While this is a valuable element of a writing education, there is room for something that speaks more broadly. The Writer’s Practice invites students and novice writers into an intellectually engaging, active learning process that prepares them for a wider range of academic and real-world writing and allows them to become invested and engaged in their own work. John Warner has more than twenty years’ experience teaching college-level writing, working with a range of students on developmental writing through graduate-level studies. He has taught many different types of writing, from composition, fiction, and narrative nonfiction to technical and humor writing. A contributing writer at Inside Higher Ed, he has become a national voice on writing pedagogy and writes a weekly column on books and reading for the Chicago Tribune. He is the author of five books. An editor-at-large at McSweeney’s, he has worked with writers who have gone on to publish in outlets including the New York Times, The New Yorker, and the Guardian.